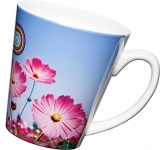 4 Key reasons to use promotional latte mugs! In a typical British office, every person has their own favourite mug. What's more, people are really super protective of them. A stolen or misplaced mug has been the cause of many office fights. It's funny, but they are almost as important as the way people take their cups of coffee or tea. So, when we're talking about brand exposure, wouldn't it be great if your brand became a part of that routine? It would do wonders for your brand visibility and awareness. Furthermore, if people use a mug with your logo on it every day, they'll subconsciously get attached to it. Consequently, by association they'll feel the same closeness with your brand. Promotional latte mugs are ideal items to hand out at business meetings, exhibitions, trade shows, conferences and corporate events. Even when people say that they don't care about having their own mug, most of them aren't truthful. Let's face it, everyone likes their own mug - right? Therefore, you can see why people will be more than happy to accept and use your latte mugs. However, why restrict yourself to other companies? What about yours? 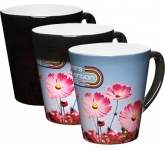 There are a plethora of benefits corporate branded latte mugs can bring to your business. Among others, you need to use promotional products in your business place as well. When you use printed merchandise in your own offices, you strengthen your brand. When clients and investors walk in, you want to have your logo everywhere. That way, you are presenting a unified front, and you're demonstrating a strong brand. The reach of latte mugs is almost endless, it's amazing what such a small item can do for your brand visibility and profit. 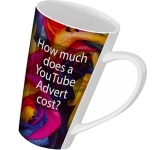 Since latte mugs are budget friendly, yet expensive-looking, they are one of the first choice promotional items. So, don't miss out! 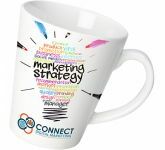 Include branded latte mugs in your marketing strategy and enjoy your increased return on investment. 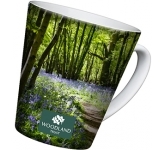 We offer a variety of printing options on our latte mugs from screen printing right through to the latest in UltraHD print technology allowing us to reproduce full colour images and logos to a standard most can only dream of. 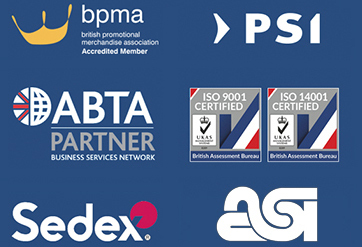 So, if you are looking for low cost promotional latte mugs, and find the same mugs cheaper, with the same print specification, just let us know and we will match the price and back it with our industry Award Winning Customer Service - that's our guarantee!! For additional information on how promotional mugs can help your business or to appreciate why promotional products are a great investment, contact us and have a chat to one of our account managers who will be happy to advise you further.